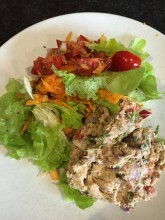 You can also use Salmon Fillets / Kippers / Sardines for this recipe I have an intolerance to any dairy so I came up with this recipe to be sure that I am getting adequate calcium in for my bones & teeth. Mackerel, Sardines & kippers contain the small bones of the fish which are high in calcium. When blended into this recipe you can’t feel them at all. This is my favourite recipe at the moment, it couldn’t be easier!